grandma's cookie jar: 2014 Christmas Give-Away - LeapBand! A couple months ago I was invited to try the new LeapFrog LeapBand and give two away, so I happily said, "Yes!" LeapFrog sent me one of their new LeapBands for me to review for free - they asked me to try it out and write my own opinions of this new activity tracker for children . . . which I did - so I'm sharing it again today, because I have another one from them to give away! Excellent price point - only $40!!! This is a big one - no batteries required!!!! The batteries are rechargeable!!!! Parents can set the LeapBand for "quiet times" - such as when children are at school or in bed so they can not play with it when they should not or when you want them to be sleeping! Children can play games with their "pet" and they can also accept activity challenges where they move in specific ways for specific lengths of time - I love the Activity Challenges! Hop like a frog, pop like popcorn, jump five times and clap your hands and many more! 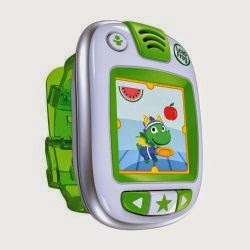 LeapFrog says; "The LeapBand is a new wearable activity tracker designed just for children which encourages active play and healthy habits through interaction with their very own personalized virtual pet. The LeapBand activity tracker gets kids moving and having fun with 50 different activities and challenges, tracking a child's physical moves so the more active a child is, the more points they earn with their virtual pet. As the child earns points through active play, they can unlock additional games, challenges, levels of play and virtual rewards for their on-screen pet. The LeapBand has an aspirational fit-band style designed with kids in mind, and high-tech features including a build-in accelerometer, a high-resolution color screen, a rechargeable battery and water-resistant design, making it the ultimate activity wearable for kids." I agree! This grandma loves the LeapBand! It is a very fun way to get children learning and moving at the same time! I love how children can choose as they play what they want to do - the mini-games with their "pet" or the Activity Challenges - or both, and I love the variety and creativity as well as the fun in the Activity Challenges! They would be great fun for the whole family to do together! LeapBand is a definite "hit" and would make a wonderful gift for birthday or Christmas . . . which is actually just around the corner! I'm extremely happy to say, not only did LeapFrog send me a LeapBand to review, but they are making another available for me to give away! (USA only) If you are over the age of 18, live in the USA and would like to be included in this give-away, which will be on November 25, 2014, you may enter by commenting below to tell me a fun and unique way you would like to get your grandchildren moving - I think "flying" like a SuperHero would be fun for my grandsons or "stomp, stomp, stomping" like a ginormous, humongous monster! I follow on Google +, Google Friend Connect, and I liked on facebook. I also shared on facebook. :) This looks adorable! No grandkids yet. My kids are 3 and 5. We like to take nature hikes behind our house. No grandkids here...just two little boys 5 and 8. I like to do dance parties with fun music to get them moving. I think hiking is a great way to get your kids moving. We like to go on "hunts" around the neighborhood. Don't forget a bucket or bag for any treasures found! I love getting my grandkids up and moving and jumping around and acting silly. We like to march together. Sometime we use our instruments and turn it into a marching band. My kids love playing basketball. I like to get my children moving by acting out the books we read. Their favorites are stomping dragons and flying fairies. Thanks for the chance - this looks like a lot of fun - I'm sure my youngest would love it.